Before talking about the preeclampsia symptoms, you should know what the condition really refers to. It is a complex condition that affects about 5% of all pregnant women. It is said that you have preeclampsia if you have high blood pressure and protein in your urine after the 20th week of pregnancy. In the majority of the cases, the symptoms of preeclampsia appear after the 37th week, but they could develop at just any moment of the pregnancy, during labor or shortly after childbirth. The symptoms could also appear during the first 20 weeks, but this usually happens in case of a molar pregnancy. The symptoms of preeclampsia can vary in severity and its progress could also be slow or fast. Sadly there is no cure for the condition, but the doctor can help manage it and the affected women are closely monitored. The patients get better once they deliver the baby. As it has been mentioned before, the condition can appear suddenly and this is why it is important for women to know about the symptoms. In case you experience puffiness around your eyes or swelling of the face, swelling of the hands, feet or ankle, you should make sure to call your doctor or midwife. These symptoms of preeclampsia are caused by excessive water retention and this could also lead to fast weight gain. This is why you should tell your health care provider if you gain more than 4 pounds per week. Nonetheless not all the women experience these symptoms. The affected women could also have some more severe preeclampsia symptoms that include persistent and severe headache, changes in vision such as – blurriness, double vision, flashing lights or spots, temporarily loss of vision or light sensitivity – tenderness or pain in the upper abdomen, nausea and vomiting. It is important to know about the symptoms of preeclampsia that they could vary from one woman to the other. In the early stages, the condition normally doesn’t have any symptoms. Even more, some of the symptoms, like swelling and weight gain may seem to be normal symptoms of pregnancy. This is why you may not know that you have preeclampsia symptoms until the condition is found during a routine prenatal visit. You may see why it is so important to attend all of your appointments. You can never know what your doctor could find, and it is better to be safe than sorry. As you may have seen, some of the symptoms of the condition may seem to be normal during pregnancy. This is why it is important to have a urine test to see the protein levels of the urine and the doctor will also check your blood pressure during the routine check-ups to make sure that it is within the normal ranges. 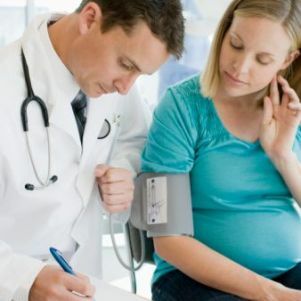 If you happen to see any changes that may be preeclampsia symptoms, no matter how small they might be, the best thing for you to do is to talk about it with your doctor. He or she should check the reasons of the changes even if they seem to be nothing. When it comes to the symptoms of preeclampsia, it is better to be really suspicious. Nonetheless that doesn’t mean that you have to panic if you gain one pound or if your legs and ankles seem to be a bit swollen, these are natural pregnancy symptoms. As you can see there are many different kinds of preeclampsia symptoms and it is possible that you won’t experience them or that you will have all of them. What You Need To Know About Preeclampsia?